There’s nothing in here about technique. There’s nothing in here about structure. Nothing here about intention. Happy to oblige, Mr. Thomson. Spoilers ahead. 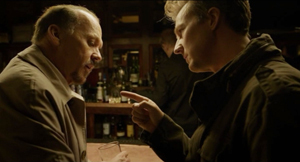 Birdman’s plot covers six days at a critical period in Riggan’s life. 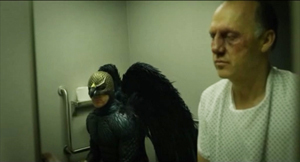 He’s an over-the-hill movie star identified with playing the crime-fighting superhero Birdman. Now he’s directing and starring in a play he has based on Raymond Carver’s short story “What We Talk about When We Talk about Love.” The film’s plot starts on the day before the first preview, when during a rehearsal Riggan hires the arrogant but talented actor Mike Shiner. Three nights of more or less bungled preview performances follow. The climax comes on opening night. In the play’s suicide scene, the despondent Riggan shoots off his nose. The Times critic publishes a rave review and Riggan, recovering in the hospital, finds that he has a Broadway triumph. His response to that, however, is rather ambivalent. The film feels a little odd—“quirky” is the official term—but its blend of comedy and drama is constructed along familiar lines. The major characters have goals. Riggan wants to prove he can do something valuable, while paying homage to Raymond Carver, who encouraged him when he was starting out on the stage. Riggan is also disturbed by his failures as a father and husband; mounting this play about love would seem to be an act of penance. The protagonist’s search for authentic success and psychological stability might remind you of8 ½ and All That Jazz, which also endow their protagonists with flamboyant fantasy lives. The other characters state their goals in that confessional mode typical of melodrama. (Extra motivation: in the world of the theatre people are always ready to overshare.) Mike wants to express himself artistically and to make Riggan’s play conform to his standards of honest realism. Lesley, the female lead and Mike’s girlfriend, wants to make her Broadway debut a success. Jake, Riggan’s producer, is trying to pull the whole thing off. Riggan’s scowling daughter Sam is looking for a settled life after a stint in rehab, while Riggan’s girlfriend and second lead Laura wants to have a child. As the plot develops, in true Hollywood fashion, the major characters achieve their goals. Structurally, the plot falls into the four parts that Kristin has found to be common in Hollywood features. The Setup lays out the premises for the action—identifying characters, explaining their motives, and articulating their goals. It’s packed with exposition, ranging from the old standby in which a character announces what the other character knows (“You’re my attorney. You’re my producer. You’re my best friend”) to the meeting with the press in which Riggan’s past as a movie star and his hope for this production are redundantly laid out. The thirty-minute setup ends with the first botched preview and Riggan’s moment with his ex-wife Sylvia. He explains that the production means everything to his self-respect. 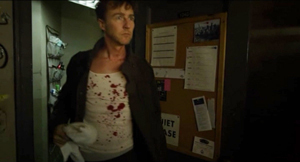 The Complicating Action, a counter-setup which redirects character goals, centers mostly on the effects that Mike has on the show. Since he drunkenly improvised during the first preview, Riggan realizes they have to come to some understanding. Mike’s onstage antics in the second preview threaten Lesley’s hopes for a breakout career. They break up, and Mike and Sam begin flirting. Mike also steals the spotlight in a newspaper feature about the production, even swiping Riggan’s story about Carver’s encouragement. More deeply, Mike’s rants against Hollywood make Riggan feel even more fearful that his play will be a disaster and he’ll be a laughingstock. All of these anxieties come to focus in an extended inner dialogue between Riggan and Birdman, who insists that he will fail and will have nothing left. Riggan is ready to cancel the show, but Jake pushes him forward. About an hour in, near the midpoint, we get the Development. This typically consists of a holding pattern. The plot doesn’t advance much. Riggan’s conflict with Mike deepens and his worries about the show mount. Lesley thanks him for giving her a chance, he reprimands himself again for being a bad dad to Sam, and Sam and Mike become a couple. A comic interlude, probably the film’s most widely-known scene, adds to Riggan’s debasement. He’s locked out of the theatre and, wearing just his underpants, races around the block through a Times Square crowd. Reentering the theatre, he plays the crucial motel scene by lurching down the aisle and onto the stage, where he enacts the suicide. It’s also during the Development that Riggan meets Tabitha, the Times critic, and learns that, sight unseen, she plans to roast his play. The next morning his fantasies take over and, urged by Birdman, he enjoys a swooping and soaring flight around the theatre district. The fourth part, the Climax, begins with the intermission during the premiere. The audience drifts onto the sidewalk, praising the first act. Backstage Riggan tries to calm his nerves. 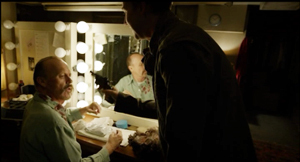 After confessing to Sylvia that he once tried suicide, he takes the pistol on stage and prepares for the motel scene. On stage, as if succumbing to Birdman’s rhetoric, Riggan confesses, “I don’t exist.” He blasts off his nose. After a brief montage, the epilogue shows us the result. Recovering in the hospital, Riggan has a successful play, a sympathetic ex-wife, and a daughter reconciled to loving him. Even Birdman, sitting on the toilet, is for once silent. But the very last moments are equivocal and for once you won’t get the spoiler from me. Suffice it to say the tag is ambiguous in magical-realist fashion. The plot helps us trace character change along classical lines. Key locales mark phases of the action. Sam and Mike meet on the rooftop twice, Riggan visits the bar twice, and Riggan’s ex Sylvia comes to his dressing room once in the Setup and once in the Climax. Whenever we return to the stage we see a version of either the apartment quarrel or the motel suicide. (We do glimpse, also twice, a hallucinatory scene of dancing reindeer, associated with Laura.) The main arenas are the stage and Riggan’s dressing room, which is the site of eight major scenes. The corridors snaking around the theatre serve as transitional spaces. As the film goes on, González Iñárritu tells us, the corridors get narrower and dingier. The fairly rigid time-structure of the plot finds a counterpart in a to-and-fro spatial pattern that measures Riggan’s jagged decline. I’ve barely mentioned one of the crucial factors in the film’s narration. From the start Riggan hears the voice of Birdman admonishing him to return to superhero movies and give up this arty stuff. At certain points, it seems that Riggan gains some telekinetic powers, enabling him to smash flower pots, furniture, and light bulbs with the wave of a hand. These moments can be construed as subjective, in the sense that he “actually” destroyed them in a normal rage but felt that he was disposing of them through a superhero’s powers. These powers are suggested at the start with an image of him levitating during meditation. They come to a kind of climax when he launches himself, a trench-coated Birdman, into the air, in a flight that serves as a counterweight to the humiliation of his naked canter through Times Square. Again, the film’s narration suggests that it’s all in his mind: after he lands and returns to the theatre, a cab driver pursues him demanding his fare. The nagging voice of Birdman supports another kind of structure, a thematic one pitting East Coast and West Coast values. The material is traditional, being given sharp expression inThe Band Wagon. The opposition goes back at least to Twentieth Century (1934, a Hollywood satire on Broadway pretensions) and Merton of the Movies (1922, a Broadway satire on Hollywood vulgarity). Of course the two artforms feed off one another. Twentieth Century started as a play, and Merton was made into a movie. The Producers began as a movie mocking Broadway, it became a hit Broadway musical, and the musical was made into another movie. Birdman revisits these well-worn themes. Mike and Tabitha excoriate Riggan for his trashy films; only the theatre is real art. By contrast, Birdman’s croaking whispers remind Riggan that millions of ordinary folk like his blockbuster movies, while the theatre is for phonies. Mike’s narcissism and pretentiousness, the absurdity of his notion of realism, and the snobbishness of Tabitha all support Birdman’s point. As is common in such movies, the Eastern elite is shown as a pushover for superficial seriousness and ham acting. At the same time, Riggan sincerely wants to pay homage to the emotional core of Carver’s story; he may just not realize how bad the idea is. The eternal Hollywood/Broadway opposition is sharpened in the light of new entertainment trends. 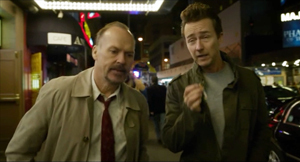 Birdman tells Riggan that old superheroes—presumably those of the vintage of Michael Keaton in Batman (1989)—have it all over “posers” like Downey and the new generation. This motif refers, I think, to the modern trend toward troubled superheroes, set up in Burton’s Batman and carried to neurotic extremes in later comic-book sagas. But of course Riggan personifies the troubled superhero himself. The sense of Riggan being old-school is reinforced by another familiar thematic duality, that of the young versus their elders. Riggan’s conflict with his daughter recycles the motif of a father so obsessed with work and seduced by false values that he ignores his daughter. (What is it with our filmmakers and this father/daughter thing? Is it just a way to pair older men with cute younger women in a safe way?) Sam berates him for being invisible in today’s world. You hate bloggers, you mock Twitter, you don’t even have a Facebook page. You’re the one who doesn’t exist. . . . You’re not important. Get used to it. The modern definition of entertainment includes the Internet, a realm that Riggan enters only by accident during his skivvy promenade. Sam’s denunciation reiterates Birdman’s insistence that Riggan doesn’t exist, except that she makes it worse: even if he returned to the Birdman role, no one would care. 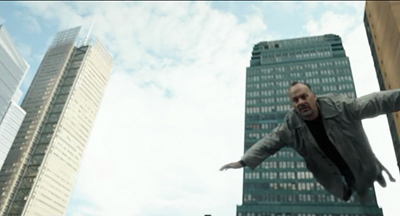 The presentation of superheroics in Riggan’s fantasy mocks summer tentpoles, and would appear to express director Alejandro González Iñárritu’s distaste for action extravaganzas. But the movie is pretty hard on the theatre world too. It’s unfair for Mike and Tabitha to castigate Riggan now that playing a superhero has become artistically legitimate. The only performers Riggan can imagine replacing his wounded cast member are accomplished actors (Harrelson, Fassbender, Renner) who also star in franchise entertainments. The new entertainment economy shows that Riggan was a pioneer; now everybody wears a cape. But these stars routinely do serious films, even Broadway drama, along with tentpole movies. Why can’t Riggan cross over too? The disruption that arrives when popular entertainment invades the sacred space of the theatre finds a hallucinatory expression during the climactic montage. 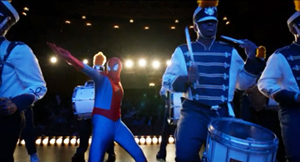 Now street drummers and superheroes crowd the stage of the St. James. What price Tabitha’s Art of the Theatre with Spidey drawing big crowds? At the end, Riggan earns his accolades as an actor, but what he’s been after, hinted at in the references to Icarus and the liberation of his flight over the city, is validation of his worth. Once he realizes he is indeed loved (by ex-wife, daughter, best friend), he’s happy to pay the price of his nose. He gains a new superhero cowl, a gauze-bandage mask, and a surgical version of Birdman’s beak. And now that flight is no longer fleeing, he can consider all his options. This plot could easily have been presented in a manner typical of today’s moviemaking, both indie and mainstream. That is, there might have been hundreds or probably thousands of shots. But Birdman, we’re told by people who should know better, consists of a single shot. Any viewer can see that’s not true. Depending on how you count the opening quotation from Raymond Carver (is it part of the credits, or a separate shot? ), there are sixteen discernible shots in the movie. Apart from the titles, the opening gives us three quick images—a seaside landscape with jellyfish, two shots of a plunging comet—and the final portion of the film provides a montage of nature scenes, interiors, and stage performers. Admittedly, these shots account for little of the running time. 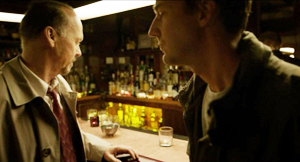 The bulk of Birdman consists of what appears as a continuous shot running a little over 101 minutes. In production, several shots were merged seamlessly into the one that we perceive. The hospital epilogue consists of another long take, that lasting about eight minutes, and it too may have been assembled from separate takes. Filmmakers confront a lot of options for handling long takes. The boldest, probably, is the static framing that doesn’t use camera movement. This option is employed in early cinema (viz. the Lumiêre films), in the tableau tradition I’ve gabbled about fairly often, and by some very rigorous directors like Hou Hsiao-hsien, Andy Warhol, and Jean-Marie Straub and Danièle Huillet. But most films using long takes rely upon camera movement. 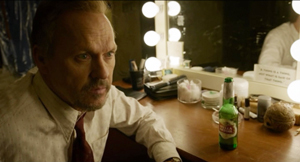 In Birdman, unsurprisingly, the camera movements are typical of Hollywood’s modern intensified continuity style. For example, we often get the push-in on a character close-up. We get orthodox Steadicam movements trailing a character from behind or backing up as he or she strides toward us. This yields the familiar walk-and-talk. And we get the standard treatment of people around a table, with the camera circling it to pick up each one’s reaction at a critical point. 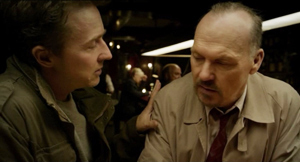 To a great extent, then, Birdman’s long-take style stitches together schemas that are well-established in contemporary Hollywood. Another current device is the occasional depth shot yielded by wide angle lenses. This technique was well-established in Hollywood in the 1940s, and today’s filmmakers rely on the same sort of tools that classic cinematographers used: strong lighting and wide-angle lenses. 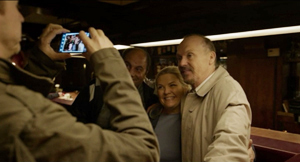 The wide-angle lenses used on Birdman, only 14mm and 18mm, don’t always create wire-sharp focus in depth, but they provide enough visibility to create depth effects. Sometimes the rear plane is made sharper through racking focus. More pervasively, in many long-take films, the camera movements replicate the patterns we find in an edited scene. Editing gives the camera a kind of ubiquity: it can go anywhere. Tethered to unfolding time, the long take sacrifices the ability to change views instantly. Yet in such films the action is staged and framed so that nothing important escapes our notice. The action gets spelled out as precisely as it would if the scene were edited. 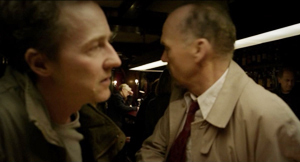 People have wondered a lot about the hidden edits that blend Birdman‘s long takes, but more important, I think, are the ways that the style adheres to standard editing patterns within its long takes. For example, the over-the-shoulder angles of shot/reverse-shot are mimicked by a camera arcing to favor first one character, then another. We can get shot/ reverse-shot effects via mirrors. A pan can also approximate a point-of-view shot, as when Tabitha sees Riggan at the other end of the bar. 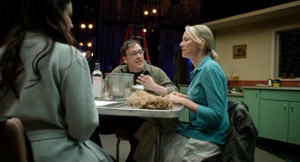 Throughout, the ensemble staging motivates shifts that would normally be covered by cuts. 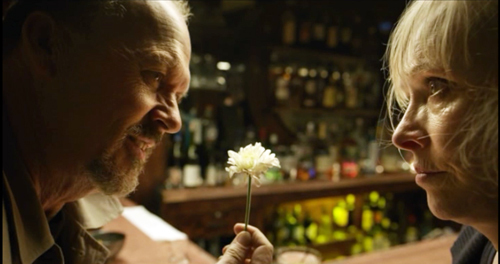 Mike and Riggan are seen from behind the bar, but when customers spot Riggan and ask Mike to take a picture, the camera sidles around the bar. As Mike and Riggan turn back to the bar we are effectively 180-degrees opposite to the first setup. With cutting, a similar shift would have been motivated by changing the axis of action through shifts in staging. Long-take shooting can’t mimic editing perfectly. An unbroken shot doesn’t yield the instantaneous change of angle supplied by a cut. But the scene can’t be allowed to go dead while the camera operator shifts to a new spot. So the interval between one sustained angle and another has to be filled up by dialogue and physical action. One way to motivate the change of camera position is through the actors’ changing positions. 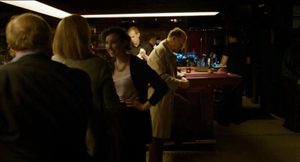 In the bar scene, the fan’s photo op motivates the camera move. Alternatively, the actor’s gestures can provide some wedged-in bits. 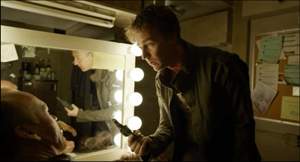 When Riggan and his wife have an intimate talk at his dressing table, he executes some business with a beer bottle that justifies shifting the angle to favor him. Once we’re on him, he turns serious and the dialogue and facial expression motivate a push-in. In normal shooting and cutting, the technique is fitted to the unfolding action. With a commitment to the long take, the director must fit the action to the technique. This is why, I think, González Iñárritu and his DP Emmanuel Lubezki spent months blocking the action on a sound stage and hiring stand-ins to move around the sets they’d built. Long before the actors came on the set, the filmmakers had mapped out many wedged-in bits of action they’d execute. Giving up cutting forces other storytelling decisions. A narrative film typically distributes knowledge among its characters, and so the long-take camera must carve a path through the story world that either restricts or expands what we know. The mobile long take sticking with one character tends to restrict our knowledge. The long take that shifts among characters gives us a wider range of information. And whenever one character leaves another, there’s a forced choice: Which one does the narration follow? This is a choice in any storytelling medium, but in the long-take film the options are narrower: the issue is which one the camera will follow. 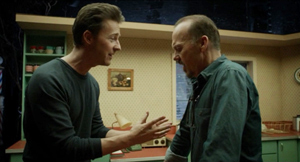 Birdman stays mostly with Riggan, but in the Complicating Action and Development sections, the narration needs to give us information on the doings of Mike, Lesley, and Sam. So, in another act of fitting and filling, the choreography must make those characters adjacent to some other action. The mazelike playing space of the film, in the bowels of the theatre, facilitates these comings and goings, so that we can drop one character and pick up another. When Lesley and Laura kiss, Mike interrupts them and Lesley hurls a hair dryer at him. He ducks out. We could stay with Lesley and Laura, or follow Mike. We follow Mike so that we can shift to the new scene, with him visiting Riggan to complain about the pistol and then joining Sam on the roof. Nothing more of consequence will happen between Lesley and Laura; following Mike will lead us to the next story bit. The camera sees all that matters. The long take’s muffled mimicry of orthodox editing pays some dividends. 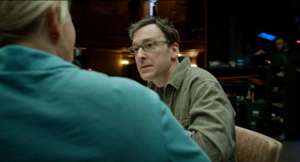 Arcs and short pans work when characters are close together, but if an encounter is played out in medium shot and one character pulls away, the camera is forced to pick a target. Whom will it follow? This effort becomes quite expressive when Mike is punching up Riggan’s table scene. Just as Mike takes over the rewriting of the lines, he hijacks the camera. Things start with the usual circling shot. Now that the two are in proximity, we can see Riggan, infected by Mike’s energy, deliver a more spirited line reading. The scene ends with a segue to the next passage of walk-and-talk, as Sam comes onto the stage in depth. In such scenes, the obstinate commitment to the long take itself motivates a dramatic effect. Later, Sam’s tirade about Riggan’s irrelevance gains force because the camera swings to her and stays fastened there. 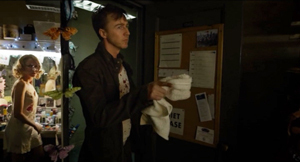 In a cutting-based scene, there would have been the temptation to show Riggan’s reaction while Sam is unloading on him. True, we could get the same delayed revelation of his response by letting her tirade play out before cutting to him. But given our tacit adherence to the long take, and given the initial framing, we can’t see both of them. The refusal of editing itself justifies holding on her and suppressing his response. In the same way, showing her somewhat chastened pause and then following her walking past him motivates finally revealing his reaction. A bonus: This scene’s concealment of the reverse angle—what is Sam seeing?—anticipates the film’s final image. We often hear that the long take ties us to “real time.” And clock duration, with one minute onscreen equaling one in the story, is indeed a convenient, normative default. Yet suitably cued, a long take can halt duration in the present to give us flashbacks, as we’ve seen at least since Caravan (1934). Films by Angelopoulos, Jancsó, and others have shown that the long take can compress or expand story duration, and even replay events. The remarkable Iranian single-shot feature Fish and Cat of 2013 is full of ribbon-candy time wrinkles. Once more, Birdman plays it straight. Like a normal movie, it uses sound bridges and night-to-day transitions to skip over stretches of story time. 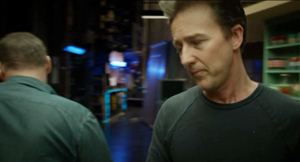 The film is a clear-cut example of the difference between story time (the years of Riggan’s career and the others’ lives), plot time (six days), and screen time (about 110 minutes). The central long take creates ellipses akin to traditional scenic links, and it does so in ways that are easy to grasp as we’re watching. The crucial creative decision behind the film was the choice to shoot the extended take. González Iñárritu asserts that he didn’t model the technique on Rope but rather on the long takes of Max Ophuls. He also acknowledges that he was enraptured by Aleksandr Sokurov’s Russian Ark, a feature film that was indeed shot in one long take (thanks to video, but without CGI blending). The status of the long take has changed across the history of film. In the first twenty years or so, it was more or less taken for granted as the most basic way to shoot a scene. Longer takes became rarer in most national cinemas during the 1920s, with editing becoming the preferred technique for building up action. Even complicated camera movements were consigned to comparatively brief shots. The long take in today’s sense emerges most vividly in the early sound period, when directors began to use it creatively. During the 1930s, some long takes would be static or relatively so, in films like John Stahl’s Magnificent Obsession (1936) or musicals, especially those featuring Fred Astaire. Other long takes would make extensive use of camera movement. A great many early talkies begin with a fancy traveling shot before moving to more orthdox, editing-driven scenes. And the musicals of Busby Berkeley flaunted outrageous crane shots. In Japan, the USSR, France, Germany, and many countries, the sound cinema brought a renaissance of long takes, propelled by camera movement. For the most part, this technical choice was felt to serve the story. You sustained the shot because the rhythm of performance benefited, or because you wanted to explore a space through a camera movement. In Dreyer’s Vampyr (1932), the tracking shots are designed to create uncertainties about where characters are when they go offscreen. Behind the scenes, though, the filmmakers felt a certain pride in making a solid tracking or crane shot. A lengthy camera movement was a challenge because the cameras were big and bulky, they had to roll smoothly on tracks or other supports, lighting had to be controlled carefully, and equipment noise might be picked up. Despite the difficulties, in the 1940s, some American directors seemed to have welcomed longer takes. The new interest probably owed something to new technology, such as the crab dolly’s ability to edge the camera through narrow spaces and turn in many directions. With complex camera movements easier, the takes could become longer. At a time when most films averaged eight to ten seconds per shot,Otto Preminger could make Daisy Kenyon (17 seconds), Centennial Summer (18 seconds), Laura (average 21 seconds), and Fallen Angel(33 seconds). There were as well Billy Wilder with Double Indemnity (14 seconds) and A Foreign Affair (16 seconds), Anthony Mann with Strange Impersonation (17 seconds) , and John Farrow with The Big Clock (20 seconds). This isn’t to mention the big long-take films of the period from The Lady in the Lake to Rope and Under Capricorn. The opening ofRide the Pink Horse contains a remarkable long-take tracking shot, and one shot in Welles’ Macbeth consumes a full camera reel. It seems that for some directors sustaining the take was itself the main concern. The more complex the locale—a crowded room, a busy street, an overgrown landscape—the more that the sustained camera movement would be considered, at least by those in the know, as a difficult technical accomplishment. The result was virtuosity, but with an alibi. Long takes are flashy. But…they can save money. (All those script pages covered fast, no need for editing.) They can be justified as realism. (The action can build over “real time.” Besides, don’t we see reality in a “continuous shot,” not cuts?) They can be motivated as subjective. (By staying with a character over a stretch of time, we become identified with him or her.) Regardless of these reasons, or excuses, there’s an undeniable bragadoccio associated with the protracted camera movement. Your peers in the industry will recognize what you’ve done, and cinephiles will applaud your bravado. The Movie Brats seized on the virtuoso camera movement and long take as a mark of prowess. A new competition sprang up between Scorsese and DePalma, encompassing Raging Bull, Bonfire at the Vanities, Goodfellas, and Snake Eyes. Even a straight-to-video heist movie like Running Time (1997), choosing to hide its cuts in the Rope manner, has a bit of playground swagger. (Bruce Campbell is in it too.) No wonder that Christine Vachon remarks that shooting a whole scene in one is a “macho” choice. It’s in this context that we can appraise González Iñárritu’s declared intentions. He was clearly drawn to the virtuosic side of the very long take, and his DP Emmanuel Lubezki had made the complex camera movement his signature with Children of Men and Gravity. After Snake Eyes showed that CGI could stitch together several long takes into a seamless whole, many directors saw that digital filmmaking could extend the shot beyond anything in analog cinematography. A new level of virtuosity was called for, not only the logistics of choreography but the skills of hiding the cuts. Do it right, you might even get tossed an Oscar or two. Is it showoffish? No, it serves the story. But there’s still virtuosity—art conceived as a triumph over self-imposed obstacles. I’ve never cared much for González Iñárritu’s films; they always seem too close to their influences. (My remarks on Babel are here.) 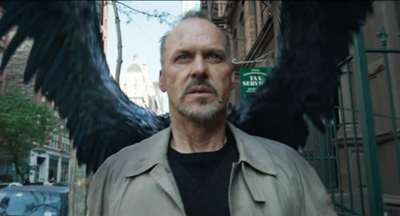 Still, Birdman seems to me a fascinating example of how traditions can be revisited, or at least repackaged. I can also appreciate the skill with which the whole affair has been brought off. But I also wish that critics and mainstream filmmakers would be more accurate and comprehensive when talking about film form and style. 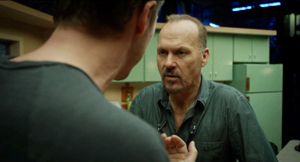 Birdman isn’t a single-shot movie, and to insist on that point isn’t just pedantry. Part of the critic’s job is to look at what’s there, and a full account of the movie (which mine isn’t) would need to reckon in the other shots the film presents. Critics should acknowledge that the long take has other expressive possibilities, some of them impossible to reduce to the patterns of continuity editing. 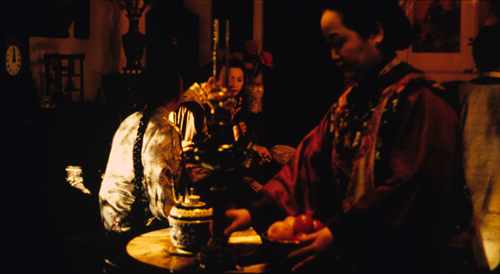 To go back to Hou Hsiao-hsien, Flowers of Shanghai consists of thirty-five shots, nearly all made with a gently shifting camera. But Hou’s mobile long takes retain the intricacy of his static shots in earlier films. The camera may circle the action, but at each moment it’s not only following one character’s movement but drawing into view other movements, greater and lesser, nearer and farther off–the whole thing building up gestures and dialogue and facial reactions, as if by brush strokes, into a rich sense of characters coexisting in a story world and a social system. The result is a gradation of emphasis, to use Charles Barr’s neat phrase, that enriches our sense of the drama. And sometimes the camera will not see all. Hou accepts the limits of the long take by making some action visible, some action partly visible, and some action unseen, even within the frame. Characters and props slide in to block the main action, sometimes shifting “against the grain” of the camera’s movement. The film’s visual flow doesn’t replicate the schemas of traditional scene analysis; often we must strain to see a gesture or reaction. Hou’s isn’t the only way to use long takes, but it’s one that deserves more attention. Granted, he and other explorers in this vein will never win an Oscar. 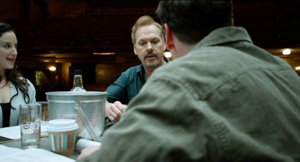 But our critics, too often dutifully repeating PR talking points, should signal that the enjoyable virtuosity of Birdman is only one way to employ the rich resources of cinema. 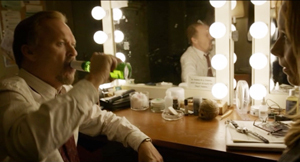 My background information on Birdman‘s technique comes mostly from Jean Oppenheimer’s article, “Backstage Drama,” American Cinematographer 95, 12 (December 2014), 54-67. So does the quote from Lubezki above. A shooting script for the film is here. Information about the concealed digital cuts is in Bill Desowitz’s Indiewire piece. The idea that a camera movement can recapitulate the pattern of analytical editing was floated by André Bazin and developed in detail by John Belton, “Under Capricorn: Montage Entranced by Mise-en-scêne,” in his Cinema Stylists (Scarecrow, 1983), 39-58. For more on the long take, see our entry “Stretching the shot.” The Christine Vachon quotation is linked there, as is De Palma’s sense of competing with Scorsese. The first essay in myPoetics of Cinema discusses trends in long-take shooting and camera movement in the 1940s. See as well Herb A. Lightman, “The Fluid Camera,” American Cinematographer 27, 3 (March 1946), 82, 102-103, and “‘Fluid’ Camera Gives Dramatic Emphasis to Cinematography,” American Cinematographer 34, 2 (February 1953), 63, 76-77. On Dreyer’s camera movements in Vampyr, see my book The Films of Carl Theodor Dreyer. I discuss Angelopoulos, Hou, and long-take staging generally in Figures Traced in Light: On Cinematic Staging. On this site, I discuss Hou’s staging practices here and here. And for discussions of intensified continuity style, see The Way Hollywood Tells It. 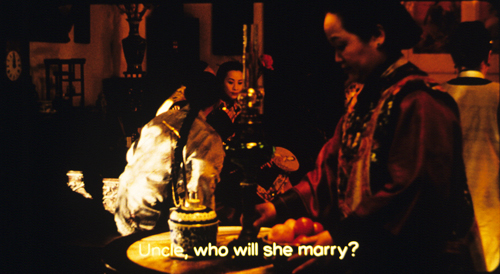 Two frames from Flowers of Shanghai (1998) are below, showing the camera’s slight movement around the central lantern and Pearl’s face, as well as the shift in the young man’s posture as he waits for an answer to his question. He’s in the process of clearing a bit of space for us to glimpse the older man, Hong, who’s sitting between him and Pearl. P.S. 24 Feb 2015: Thanks to Paul Mollica for a name correction!